I try really hard to buy products that are made in the USA. I have a few posters that I would like to display on the walls in a frame. After searching for an online store that actually made their frames in the USA, I finally came across wholesaleposterframes.com. I was so glad I did too! Often times you find something that is made in the USA and their prices are less than affordable. Wholesale Poster Frames offers affordable prices and a huge selection! Ordering is so easy! You can select from a wide range of frame styles, sizes, lens covers, backing, and frame colors. They offer standard and custom sizes to fit any poster size. They can frame more than posters too! Have a favorite sports jersey or family photo? They offer custom picture frames and shadow box frames in any size. What a great way to cherish those family heirlooms with a custom shadow box! My grandparents recently passed away and I have several items from them that I cherish dearly. I have been searching for something to display them so they aren’t just stuffed in a box and never seen. I love the idea of displaying them in a beautiful shadow box frame. It’s a way I can keep them close to me and without any damage being done to the items. Worried about UV rays damaging your precious prints and posters? 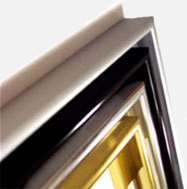 Wholesale Poster Frames offers an exclusive Framers Brand™ protective lens cover. Want a light weight unbreakable cover? They have that too! You can get these lens covers in both clear and non-glare finishes. From now on I won’t have to search for that reliable store to purchase frames for my posters and photos. I’ll be going to Wholesale Poster Frames from now on! Plus, they’re American made, which I LOVE! What’s better than that? I was looking for an affordable frame. I’m glad I came across your post! Thanks!